There are a lot of interpretations. The astral plane is best described as another dimension of reality parallel to our current dimension. there are numerous models of where the astral plane sits. Some place it in a hierarchy of dimensions, sometimes as many as seven; going from our current mundane one, to many levels of experience all the way to godhead. Other say there are only two, the living world and the astral plane, and finally, some say that it doesn’t even exist, and is purely an expression of the subconscious. A popular view of the astral plane is that it in appearance it is much like our own level of experience. You can see objects, and real life places. Many believe that when you die, you go here, and can act as a disembodied spirit; visit places and see things that have or will occur in real life, before moving on to another state of being; reincarnation or some form of ascension. As well as being like a mirror copy of our dimension of existence, the astral plane can also interact with thoughts and emotions; you can change your perceptions and create through will alone. 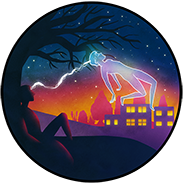 Astral projection is the most documented way to access the astral plane. This is a process whereby the mental part of the self (sometimes referred to the soul) becomes temporarily disconnected with the physical part of the self, the body. The soul part can then experience these other realms of consciousness.